The NCO’s popular annual series of eight concerts at Macclesfield Heritage Centre attracts both a loyal and a growing audience. The 2015/16 series surpassed all previous seasons in terms of audience numbers. 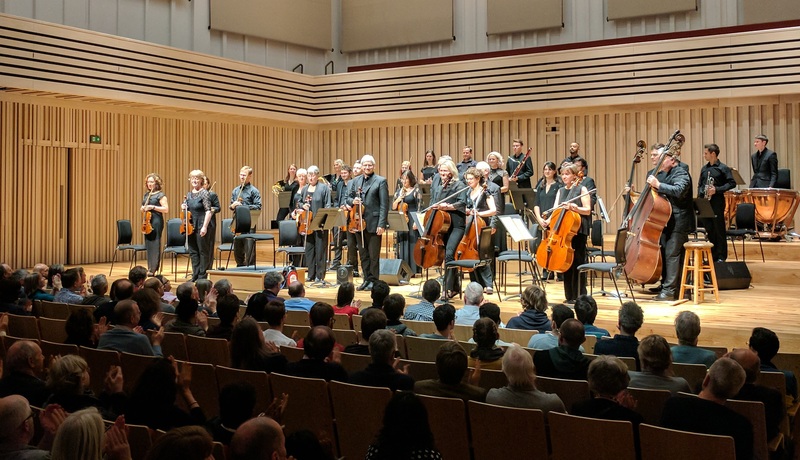 The Orchestra has ambitions to extend and develop its audience base across Cheshire, and deepen its connections to local communities through accessible and sustainable learning and outreach projects, alongside concerts for people of all ages to enjoy. The NCO is the only professional orchestra playing regularly in Cheshire East – giving audiences the unique chance to hear world-class musicians at a local venue. Audiences have a special experience at Macclesfield NCO concerts – enjoying high-quality music-making, top soloists and an interesting range of repertoire – all informally introduced by the Artistic Director and Leader of the Orchestra, Nicholas Ward, in the friendly intimacy and fine acoustic of the Heritage Centre. Ambitious programming has resulted in the NCO performing two world premieres in 2014: Adam Gorb’s Celebration and Anthony Gilbert’s Triptych. The 2016 – 2017 Macclesfield Concert Season starts on Saturday 8 October with the uber-talented, young English violinist, Chloe Hanslip, and will feature a wonderful range of programmes, and soloists of international repute. Once again, the season is being sponsored by Manchester Metropolitan University’s Faculty of Education. Macclesfield Season Sponsorship provides an association with the NCO for the duration of the season: typically, October – May. There are also opportunities to sponsor the NCO’s special 50th anniversary season (2017 /18). Sponsor credit on all Season promotional materials such as: www.ncorch.co.uk (with a link to the sponsor’s website); the Season Brochure, individual concert leaflets, posters, direct mail letters and associated press releases; concert programmes; and digital platforms. Complimentary tickets and programmes for each of the eight Macclesfield concerts. An introduction to the NCO Artistic Director, Nicholas Ward, along with the opportunity for Season Sponsor and guests to meet other members of the orchestra / soloists. Reduced price tickets for Season Sponsor staff. Season sponsorship acknowledgement from the stage at each concert. Display of company branding at each concert. Access to NCO’s Learning team for corporate training/ team-building initiatives at a reduced rate.